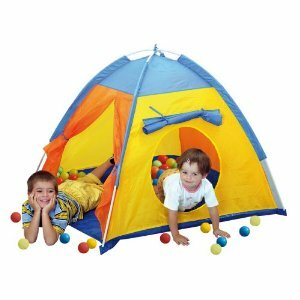 One day when I was filling my car with gas, I saw a sign at the gas station that they were selling "ball tents" (like a ball pit in a tent). 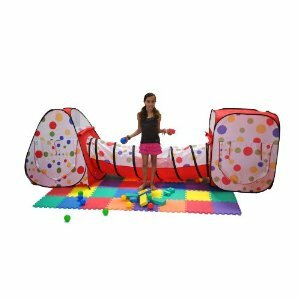 I didn't know if the 50 balls it came with would make a big enough ball pit, but supplementary packages of balls are available in quantities of 50, 100, 150, 200, 300, 400 and even 1000 balls. I thought the whole thing was a cool idea, but a terrible idea at the same time because the balls would be all over the house after approximately 30 seconds of play, and I'd spend the rest of my life collecting them and putting them away. 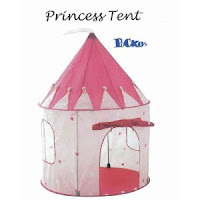 At the park one afternoon, someone set up a princess castle tent, which entranced all the neighborhood children and had them swarming over to play in it. 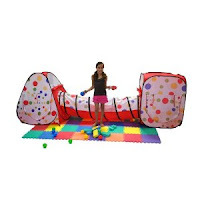 These tents come in lots of other styles too, such as pirate-themed, animal barn, circus tent, spaceship, fire station, and many of your kids' favorite cartoon characters. I thought it was adorable but not the kind of thing I'd ever splurge on. 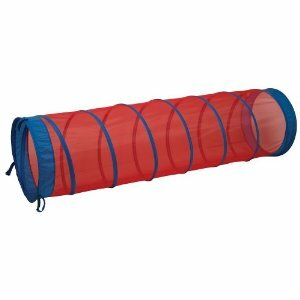 I was at another friend's house and she pulled out a pop-up tunnel, which the kids loved chasing each other through and rolling around in. At the gymboree near our house they have two tunnels, which I have been known to tie together to create one extra-l ong tunnel. At my kids' swimming lessons, they crawl through the same kind of tunnel and then dive into the pool and swim to me. A tunnel is one of those things that I figured my kids could enjoy from time to time when we go somewhere special, but not a necessity for our own home. But then the other day I was walking by a neighbor's yard and saw a possibility that had never occurred to me before: a pop-up tent with a tunnel sticking out the door. What fun my kids could have with that! Between chasing each other through and rolling around in the tunnel, shimmying through it with various toys and treasures to fill the tent with, hiding in it the tent, playing house, reading books or coloring inside, and playin g with any and every toy they own in there, this is a combination that could keep them occupied for hours. Forget a quiet, civilized meal - I could have an entire quiet, civilized afternoon! 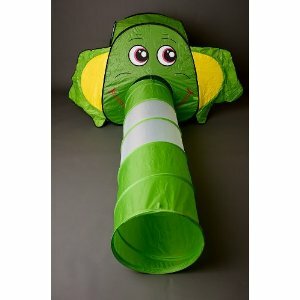 While you could buy a tent and a tunnel separately, you can also get them as a set, like this adorable elephant one, or even a three-piece set (two tents and a tunnel). 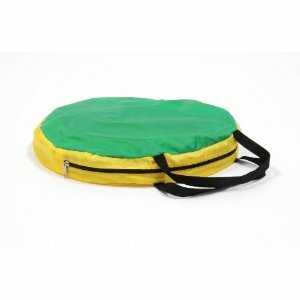 And the best part about these products is ho w compact they are. 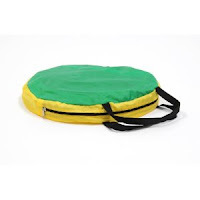 Even though they take up a lot of space while they're being played with, they fold up into a flat zipper pouch and can be stored under a bed or behind a bookcase. When you're buying toys for a tiny apartment, saving space is almost as important as saving money. here's something i hadn't thought of --what fun!! i vote for the elephant or the 3-piece one. must add to my to-buy list. thanks! My friend commented when I posted this to Facebook. She said she has a ball tent and her 2-yr-old knows the rule: if the balls leave the tent, it gets taken away.